Chrome vanadium steel blade. Chrome plated blade with magnetic tip. Line color transparent plastic handle. Chrome vanadium steel blade ensures greater hardness, strength, and durability. Chrome plated blade with magnetic tip. Soft rubber grip provides greater comfort and control. Chrome vanadium steel blade. Chrome plated blade with magnetic tip. Line color transparent handle. Chrome vanadium steel blade ensures greater hardness, strength, and durability. Satin chrome plated blade with magnetic tip. Soft cushion grip provides greater comfort and control. Chrome vanadium steel blade ensures greater hardness, strength, and durability. Chrome plated blade with magnetic tip. Soft rubber grip provides greater comfort and control. Chrome vanadium steel blade ensures greater hardness, strength, and durability. Satin chrome plated blade with magnetic tip. Soft cushion grip provides greater comfort and control. Thumb stop allows for greater torque. Chrome vanadium steel blade ensures greater hardness, strength, and durability. Satin chrome plated blade with magnetic tip. Soft cushion grip provides greater comfort and control. Thumb stop allows for added torque. Chrome vanadium steel blade. Chrome plated blade with magnetic tip. Line color transparent plastic handle. Chrome vanadium steel blade ensures greater hardness, strength, and durability. Satin chrome plated blade with magnetic tip. Soft cushion grip provides greater comfort and control. Chrome vanadium steel blade ensures greater hardness, strength, and durability. Satin chrome plated blade with magnetic tip. Soft cushion grip provides greater comfort and control. Thumb stop allows for added torque. Chrome vanadium steel blade. Chrome plated blade with magnetic tip. Line color transparent plastic handle. Chrome vanadium steel blade ensures greater hardness, strength, and durability. Chrome plated blade with magnetic tip. Soft rubber grip provides greater comfort and control. Chrome vanadium steel blade ensures greater hardness, strength, and durability. Satin chrome plated blade with magnetic tip. Soft cushion grip provides greater comfort and control. Chrome vanadium steel blade ensures greater hardness, strength, and durability. Chrome plated blade with magnetic tip. Soft rubber grip provides greater comfort and control. Chrome vanadium steel blade. Chrome plated blade with magnetic tip. Line color transparent handle. Chrome vanadium steel blade. Chrome plated blade with magnetic tip. Line color transparent handle. Standard, fluted blade is made of alloy steel for long life with hardened tips that are slip resistant. Ergonomically designed handle for comfortable grip. Chrome vanadium steel blade. Chrome plated blade with magnetic tip. Line color transparent handle. Chrome vanadium steel blade. Chrome plated blade with magnetic tip. Line color transparent handle. 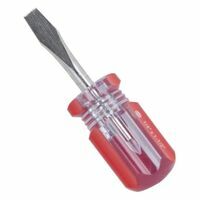 Standard fluted light blade/cabinet tip made of alloy steel nickel protected blades for long life and hardened tips for slip-resistant fit. Ergonomic grip. Chrome vanadium steel blade ensures greater hardness, strength, and durability. Chrome plated blade with magnetic tip. Soft rubber grip provides greater comfort and control. Chrome vanadium steel blade ensures greater hardness, strength, and durability. Satin chrome plated blade with magnetic tip. Soft cushion grip provides greater comfort and control. Thumb stop allows for added torque. Chrome vanadium steel blade ensures greater hardness, strength, and durability. Satin chrome plated blade with magnetic tip. Soft cushion grip provides greater comfort and control. Thumb stop allows for greater torque. Chrome vanadium steel blade ensures greater hardness, strength, and durability. Satin chrome plated blade with magnetic tip. Soft cushion grip provides greater comfort and control. Chrome vanadium steel blade ensures greater hardness, strength, and durability. Chrome plated blade with magnetic tip. Soft rubber grip provides greater comfort and control. Chrome vanadium steel blade ensures greater hardness, strength, and durability. Satin chrome plated blade with magnetic tip. Soft cushion grip provides greater comfort and control.